Need a moment of quiet? Lavender*, Vanilla, Chamomile and Sandalwood combine to create a soothing scent. Settle in as the aroma of this natural blend helps you relax and unwind. Escape to a place of serenity with our Soothing Blend. Oils help create a naturally soothing, energizing or purifying environment in your home. You want to get rid of bad odours and keep your home smelling fresh without the use of harmful chemical-filled sprays and cleaners, but finding healthy, natural alternatives can be challenging. 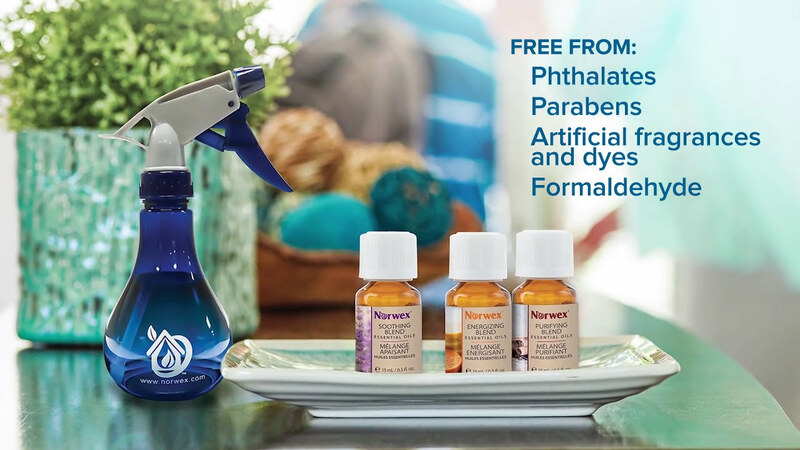 • Add 4 to 5 drops to your Norwex Spray Bottle and dilute with water to spray, lightly scenting the air in your home. • Spritz on surfaces and wipe down with your Norwex Microfibre cloths to scent your home simultaneously while cleaning. • Add 2 to 3 drops to your Fluff and Tumble Dryer Balls on cool cycle to scent your laundry. • Use a few drops on cotton balls and tuck them into drawers and linen closets to freshen up your wardrobe, bedsheets and more! • Keep out of reach of children. Avoid contact with eyes. • Multiple fragrances available, so they’re perfect for any moment. • Helps provide a pleasant scent to bed linens, comforters and duvet covers. • Aromatherapy, the therapeutic use of essential oils, is known to help evoke feelings of calmness and comfort. • Some studies suggest that several essential oils like those extracted from Lavender, Rose, Orange, Bergamot, Lemon, Sandalwood and others have been shown to help relieve anxiety and stress. Essential Oils can be irritating to skin so they are not recommended for topical or oral use. Flammable; keep away from flames or sparks.